Clear Flint Empty Glass Bottles of various size and shapes. 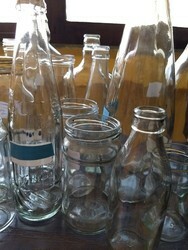 Clear Empty Glass Bottles with various size and shapes. We offer our client an excellent quality range of Flint Glass Bottles. These are made by using very superior and premium grade raw material. These bottles are high in demand in overseas and domestic markets are used to pack honey, jam & pickle. These are available in a variety of sizes and shapes to choose from. With our vision of becoming one of the leading trader and suppliers of premium grade glasses we offer to our clients exciting range of Tubular Flint Glass Bottle.